After a month of storms it finally looks like the weather is finally starting to settle with a ridge of high pressure forecast for the week so here's hoping we can look forward to warmer temperatures and settled conditions. The forecast had stuck to its word all through the week so I asked the lads did they fancy joining me on Birkett's Grasmoor to Whiteless Pike walk knowing that it has been up to twelve months since some of us had last trodden these fells, the replies came in fast and the walk was confirmed. This is a classic Lakeland walk gaining over 3,000 feet in a little over 6.5 miles meaning most of the ascent will be spent gaining Grasmoor but thereafter there is little ascent to deal with. Birkett chose to start the walk below the nose of Rannerdale Knotts, todays last summit which was practical given that Rannerdale Knotts is the final summit of the walk. We first head out into the micro valley of Rannerdale and cross Squat Beck at the familiar foot bridge from where we gain the start of the Lad Hows ridge by following a footpath high above Cinderdale Common, a steep start to say the least. Once the ridge was gained Lad How's summit lies ahead after a steady ascent followed by the steep pull onto Grasmoor summit. With most of the hard work behind us we left Grasmoor in cloud and crossed the highway linking the Coledale Fells with the Grasmoor group and summated Wandope easily. Next is the tongue twister that is Thirdgill Head Man then we descended Whiteless Edge before the short pull on to Whiteless Pike, stopping to admire the view back along the Ard Crags ridge towards the east. We continue and descend Whiteless Pike over Whiteless Breast then cross the head of Rannerdale before taking in the grassy spine of Rannerdale Knotts by which time, Spring was definitely in the air. Cast your eyes up from the road by Crummock Water, between Rannerdale Knotts and Rannerdale Bridge. A formidable mountain array is revealed. To the left, perched of the soaring flanks of Grasmoor lies Lad Hows. To the right stands Whiteless Pike. Notes: The parking spaces are owned by the National Trust and are found just off the B5289 along the shore of Crummock Water below Rannerdale Knotts and are perfectly positioned for walks up onto Rannerdale Knotts or to visit the Rannerdale Bluebells between April and May, so you may find parking quite difficult if you aren't early. There is room for around ten cars and parking is free. Despite arriving in good time I found David, Rod and Michael already at the parking spaces by the time I arrived, we greeted under the gaze of a dozing sheep which had perched itself on the grass just below the wall. One chap who arrived shortly afterwards showed concern by saying "that sheep doesn't look too well" and I replied witterly "it looks no worse than I did two hours ago" We continued to kit up as the chap went over and woke the animal from its sleeping daze who then trotted off in the direction of Rannerdale. Despite sunshine forecast it's feeling pretty cool and with no sign of said sunshine we kit up in Soft Shell jackets then add gloves and beanies if only to take the nip out of the air. We struck out along the path I think it was Rod and I who at the same time noticed a sheep lied on its back in the adjoining field which I believed to be a Texel. This is not good viewing because sheep cannot right themselves which can result in suffocation caused by gas build up or it could simply be that the sheep is heavily pregnant, we couldn't just leave the sheep on its side so myself and Rod downed our packs and scaled the wall, it was clear that the poor animal was in distress so after a one, two three we righted the sheep only for it to topple over again, after three more attempts the sheep found its feet and ran across the field only to topple over again by which time we could hear the farmer firing up his quad at Rannerdale Farm and we hoped that he'd spot the sheep in good time. Getting back over the wall proved more difficult and on the t'other side we borrowed David's and Michael's shoulder's so we could ease ourselves down where we re-shouldered packs and continued towards Rannerdale. Whiteless Pike from Squat Beck, Rannerdale. We soon found ourselves in the beautiful valley of Rannerdale and weren't surprised to find no Bluebells but by this time next month the place should be thriving with the scent and colour of the famous Rannerdale Bluebells. The footbridge over Squat Beck lies just beyond the trees up ahead. Mellbreak seen over Crummock Water from Rannerdale. We crossed Squat Beck and to our delight found ourselves walking through periodic sunshine which left the air with a nice crispness to it. The steep craggy cliffs of Rannerdale Knotts. Seen beyond a patch of Gorse bushes. Superb views over Cinderdale Common and Crummock Water towards Mellbreak. With Rannerdale now behind us we started the climb towards the Lads Hows ridge finding the initial ascent via a well worn grassy path steep causing frequent camera breaks more commonly known as "get your breath back breaks"
Grasmoor and the Lad Hows Ridge from Lad Hows summit. We continued in ascent sometimes stopping to discuss the price of carrier bags (I kid you not!) it's an age thing I'm sure! Joking aside this conversation started after I told the lads about a conversation I had with my Dad which went on for far too long about the price of carrier bags, the lads were in stitches which promoted debate on the things we do and say as we get older. Next we stopped to discuss Brexit...ohhh nooooooooo !!! Rod and Michael at Grasmoor summit. We continued steeply through the familiar heather which gave way for a stonier path once the shoulder was reached, by now Rod and Michael had gained ground on us and had reached the summit first soon followed by myself and David. In the time it took myself and David to reach the summit (no longer than a minute) cloud had drifted in and we lost all views which was such a shame given what we could have seen had we have been here minutes earlier. Grisdale Pike seen from the descent of Grasmoor. We left the summit in cloud which started to break up as we crossed the summit plateau, the cloud had completlely cleared during our descent by which time we had this exceptional view of Grisdale Pike towards the north. Sand Hill and Hopegill Head from the crossroads between Crag Hill (Eel Crag) and Grasmoor. It didn't take long to reach the footpath below from where we could with how busy Crag Hill was, there were well over a dozen walkers on the summit with more heading up from Coledale Hause. 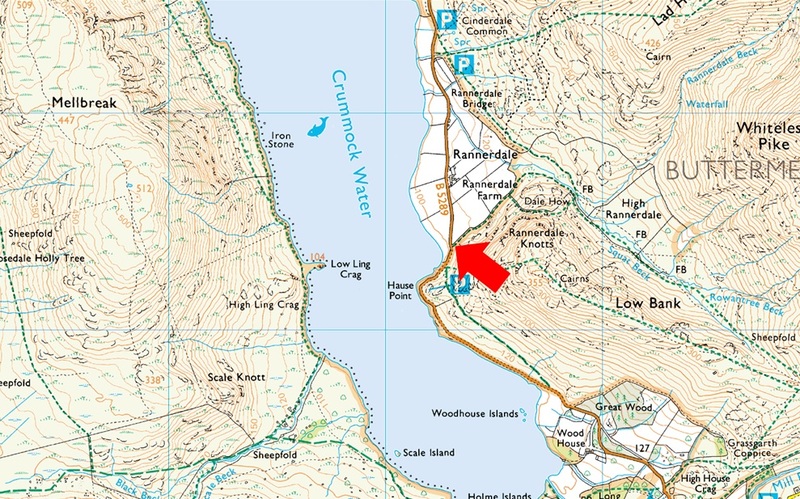 Todays route unfortunately misses out on Crag Hill in favour of Wandope which is just a short stroll away towards the south. Taking in the view over Addacomb Hole with Wandope summit in the distance. From the crossroads we made our way towards Wandope via the head of Addacomb Hole, a favoured viewing point amongst many a walker including ourselves. Here Rod explains to David just how steep the ascent is out of Addacomb Hole after David had recommended it to him some years back. It's the standing joke every time we visit Wandope now. Me, I prefer Wandope's east ridge which can be seen sloping away off to the left. That's Crag Hill (Eel Crag) with Sale just beyond. We continued along the edge of Addacomb Hole and summated Wandope in what can only be described in very poor light, so much so the pictures I did take didn't make it to the website. Leaving Wandope for Thirdhead Gill Man. Seen as the prominent cairned peak just ahead. Descending Whiteless Edge with views of Whiteless Pike and Rannerdale Knotts. We had by now been feeling the affects of the windchill since summating Grasmoor which didn't seem to be as chilled as we encountered between Wandope, Thirdhead Gill Man and Whiteless Edge, it was biting to say the least which prompted David to take a reading using his weather gadget, we were surprised to learn that it was recording just 1.6°C windchill which didn't compare to how brittle my nose and cheeks felt. The view back up Whiteless Edge. With Grasmoor seen left, Thirdgill Head Man centre, Third Gill right and Wandope far right. Peering down over Mill Beck towards Ard Crags and Knott Rigg. Views over Crummock Water towards Mellbreak, the Loweswater Fells, Loweswater, Low Fell and Fellbarrow. That's the Lad Hows ridge over on the right with the steep flanks of Grasmoor beyond. Superb views from Wandope through to Causey Pike. That's Ard Crags seen centre right with Knott Rigg far right taken as we cross Whiteless Breast. Rannerdale Knotts seen over High Rannerdale as we descend Whiteless Breast. Rannerdale Knotts seen over Low Bank. With a little sunshine poking through just here and there we continued the descent of Whiteless Breast still feeling a cold wind less the windchill of course. By now it was approaching lunchtime and we agreed to have a quick fuel stop once Rannerdale Knotts summit was reached, while heading towards the summit Rod spotted an outcrop of rocks perfectly situated out of the wind where we de-shouldered packs and ate lunch whilst gazing up at around five hand gliders who were using the thermals above High Snockrigg, it was the first time any of us had seen gliders in this area and we were intrigued as to where they had set off from. The view over Buttermere towards Fleetwith Pike, Grey Knotts, Brandreth, The Gables, Kirk Fell, Haystacks and High Crag. It's fair to say that Spring is definitely in the air today with Buttermere bursting at the seems with all the car parks full in the village and cars parked a good way back up Newlands Pass. Grasmoor, Lad Hows and Whiteless Pike from Rannerdale Knotts. Looking back on ground covered. Mellbreak from Rannerdale Knotts summit. Rannerdale Knotts was easily reached right about the time the sun came out leaving the last summit of todays walk feeling very Spring like indeed, in fact despite being just twenty minutes from the cars David decided to de-layer due to how warm it had started to feel. Looking back along the ridge towards Buttermere, High Snockrigg, Robinson, Fleetwith Pike, Grey Knotts, Brandreth and the Gables. The view along Mellbreak and Crummock Water towards Low Fell and Fellbarrow. We left quite a few people back at the summit, some walkers but mostly tourists. Keeping with Birkett's route we descend via the steep steps before sweeping below the nose of Rannerdale Knotts as our cars came back into view. We spot activity on the shores of Crummock Water soon finding that divers had set up while others paddle canoes out into the Lake whilst one chap flies a drone overhead. It's feeling very warm and I for one could not wait to remove layers leaving sweaty base layers underneath. We kit down under afternoon sunshine and even though no one spoke of it todays walk feels like we've finally said our goodbyes to Winter and opened the doors to Spring.